Florists around the country, pay attention. 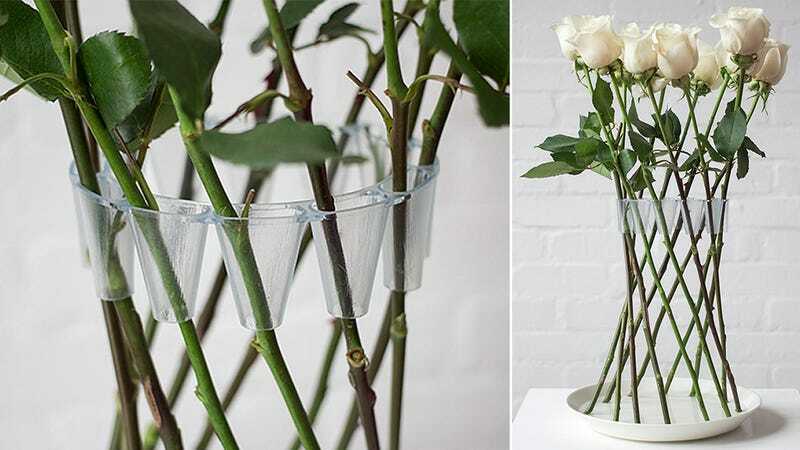 If you're looking for a value-added reason for people to buy a dozen roses from your shop, then find a way to get this brilliant Crown Vase put into production and include one with every bouquet. Designed by Lambert Rainville, a student at the Royal College of Art, the Crown Vase works as a support allowing flowers to stand via their own stems, like a simple shelter crafted by an experienced outdoors person. A shallow dish or bowl full of water is still needed to keep the flowers alive for more than a day, but when they eventually die everything can be composted and recycled, making cleanup an eco-friendly affair.